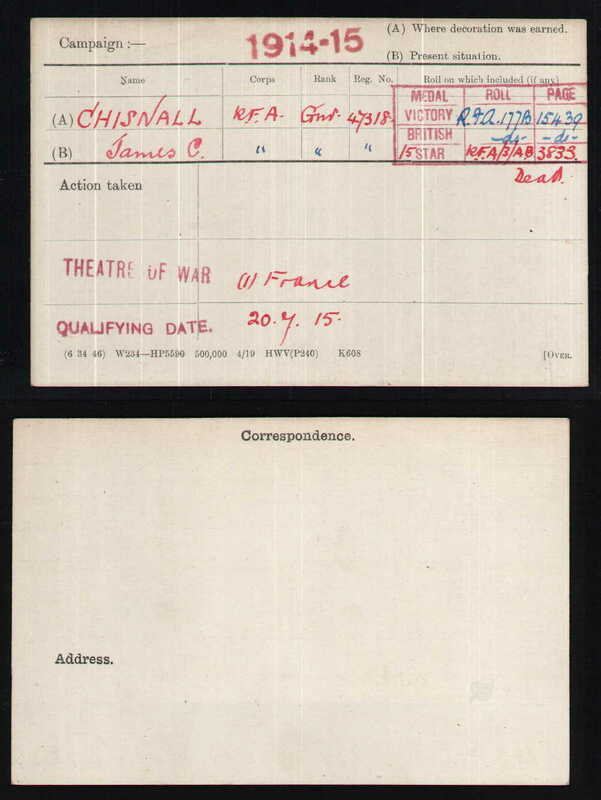 Gunner Chisnall was entitled to the above three medals; 1915 Star, British War Medal and the British Victory Medal. The whereabouts of Gunner Chisnall's actual medals is currently unknown. James Charles Chisnall was born in Hadleigh in 1896. He is often referred to a Charlie. By the 1911 census he was age 15, working as a factory hand and living at home at 13 Angel Square with his parents; James and Sarah and his siblings; Elizabeth (22), Bessie (18), Frances (14), William (10), May (8), Arthur (5), Sidney (4) and Freddie (2). At the outbreak of war many Hadleigh men enlisted with the local territorial battalion the 1/5th Suffolks, Charlie was not one of them. We know he joined the Royal Field Artillery as a volunteer, but we are not sure if that was during that early rush to arms, before or after. What we do know is that he entered France as a Gunner in a Royal Field Artillery unit on 20 July 1915. As a Gunner in the Royal Field Artillery he was part of a 6 man team manning a 4.5 inch field (or light) howitzer. The 4.5 inch field howitzer and its limber were generally horse drawn. It had an effective range of 6000m (6600yd) and could fire 4 rounds per minute. The rounds (shells) weighed 16kg (35lb) and were manually loaded. The guns were used for neutralising enemy guns, bombarding enemy defences, enfilading enemy communication trenches and for cutting barbed wire. A lot of the work would have been carried out at night. Manoeuvring the gun into position and making it ready to fire would have been a physically demanding and challenging job that required the excellent teamwork on behalf of the crew. The crew would be a tight knit team and would become very close to each other, forging friendships for life. Charlie served with ‘D’ Battery, formerly two sections with 30 (Howitzer) Brigade. 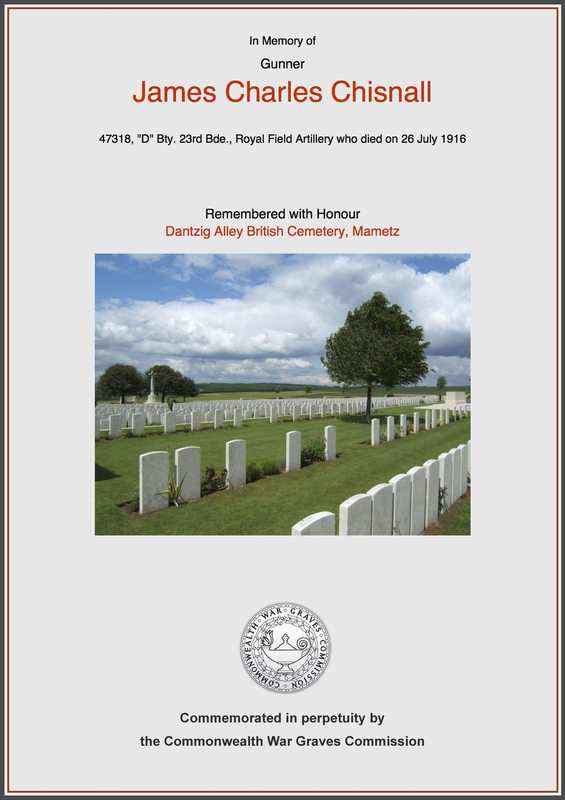 However in May 1916 'D' Battery joined 23 Brigade RFA who were soon to take part in the 1916 Battle of the Somme. At that time, each Infantry Division was allocated 2 x RFA Brigades. Each RFA Brigade included 3 Batteries (A, B & C) each equipped with 6 x 18 pounders and a forth Battery (D) equipped with 6 x 4.5 inch Howitzers. We know that 23 Bde RFA were in the Carnoy area on the 6 July 1916 and were engaged in ‘wire cutting’ in the area of Bazentine-Le-Grand ahead of the planned attack there. They continued to provide support to other ongoing operations over the following days and weeks. By the 26 July 1916 they were in the area of Montaban and while the day had been relatively quiet, at 4pm they were subjected to heavy enemy shelling. Three sergeants from 108 Battery were killed when a shell hit their mess tent. The war diary for that day also says that one gunner from D battery, 23 Bde was killed and we think that was Charlie. Charlie was originally buried in a field location, probably behind his gun line and close to where he was killed, approximately 2 miles to the East of Mametz. After the war his body was exhumed by a Graves Recovery Unit and moved to Danzig Alley Military Cemetery, where it lies today. The village of Mametz was captured by the 7th Division on 1 July 1916, the first day of the Battle of the Somme, after very hard fighting at Dantzig Alley (a German trench) and other points. The cemetery was begun on the site of the old German trench later in the same month and was used by field ambulances and fighting units until the following November. The ground was lost during the great German advance in March 1918 but regained in August, and a few graves were added to the cemetery in August and September 1918. At the Armistice, the cemetery consisted of 183 graves, but it was further extended and developed to become the main concentration cemetery for that area. Hundreds of graves were added as the men buried in the fields north and east of Mametz, including Charlie were recovered. In 2002 a new housing estate was built in Hadleigh. A number of the houses on the estate were allocated as military quarters for service personnel living in the area. During the planning phase for this development it was decided that since the estate would have a military connection, that the street names would be named after local military heroes and given that there were three Chisnalls listed on the war memorial it was decided to name one of the streets Chisnall Close. We hope that this page has been able to tell the story of James Charles Chisnall. If you know of any information which might help to add to the story then please get in touch.